Fair prices always! Call (405) 753-4473 today! Gold and silver have been the things that wealth has been built on for centuries, ever since the value of precious metals was first established. It’s never been simply the rarity of these elements that makes them so sought-after; each has a beauty all its own, a luster that can’t be replicated. Even today, gold and silver are highly sought-after. Even today, a gold coin holds great value. But many times, it’s more practical to have cash. When that time comes, make sure you proceed with caution. Precious metal dealers seem to be everywhere nowadays, buying gold, silver and coinage. When you’re looking to sell, make sure you can fully trust the buyer. Make sure you come to The Coin & Gold Exchange. We’re the most trusted name in Oklahoma City, OK, and for good reason. We always deal with our customers with total fairness and transparency. We guarantee the very best prices, and we’re experts at all aspects of our work. You simply can’t find a better deal. If you want to sell gold, we’re the people to see. Many people own at least a little gold, and it’s surprising how much even a small amount can be worth. We’ll buy scrap gold, broken jewelry and more, and you’ll get the best value possible, all of the time. If you find yourself low on ready cash, don’t worry. Your home could be a veritable gold mine. Silver may constantly be compared to its more valuable gold cousin, but that doesn’t mean it should be discounted. Silver is probably far more prevalent in your home, and therefore it can be worth far more to you. The Coin & Gold Exchange will happily take a look at your silver and tell you just how much it is worth. You may be surprised! Gold or silver coins can be worth a great deal. 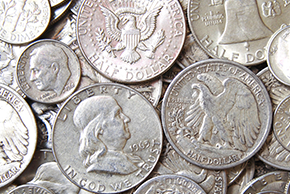 We’ll help you determine just what you’ve got on your hands, and we’ll buy coins of all kinds for great prices. The Coin & Gold Exchange is open and ready for business. Come in today!